Earlier this summer, librarian Tina Mullins contributed a post on our streaming video collections. 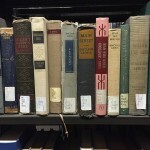 These collections are some of our many digital content offerings. In building on this, did you know that Healey Library can also help you locate digital media we don’t currently own or convert physical content into streaming formats for instructional purposes? If you find that something you’d like to use online is not currently in our digital collections, you now have the option to submit a Streaming Media Request. Staff from Library Reserves, Library Acquisitions, and Video Production (IT Department) will work together to locate, purchase and convert material to a streaming format when it supports your curriculum. You will be asked to provide pertinent information such as your course number, the semester you’d like to use the streaming content, information that will help us identify the correct film or audio recording, and pedagogical reasons for using it in support of your course. Things to keep in mind: Copyright restrictions apply. Streaming media must be used behind password protection (e-reserves or Blackboard). If you’d like to re-use streaming content in subsequent semesters, you must re-request streaming access. Streaming media access will be disabled at the end of each semester to adhere to copyright law. How quickly streaming content can be made available will depend on how quickly we are able to find your film or audio recording. If we need to order it from a vendor, it could take as long as three weeks, so get your requests in early!